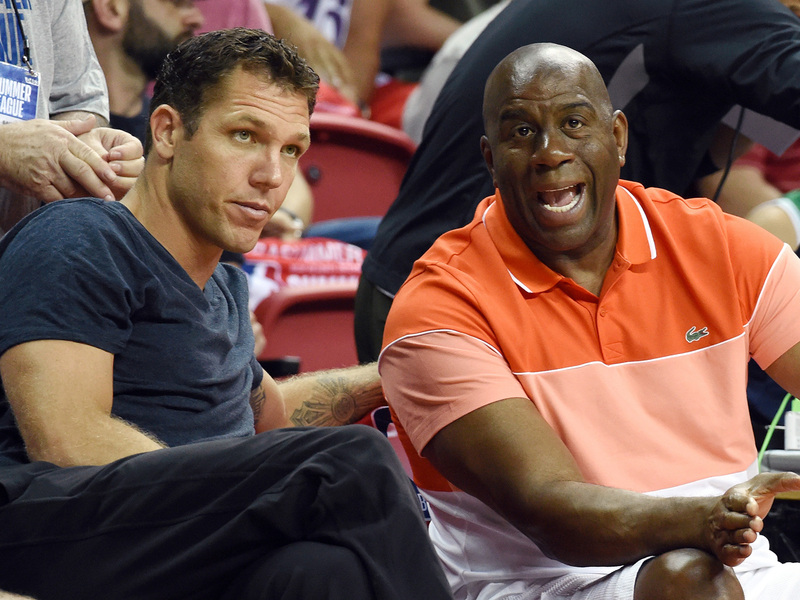 Did Lakers president Magic Johnson tamper with Paul George? The NBA, which is investigating his recent comments, will make that decision. Did the Los Angeles Lakers tamper with the Indiana Pacers while Oklahoma City Thunder forward Paul George was still under contract with the Pacers? The NBA has launched a formal investigation into this controversy. 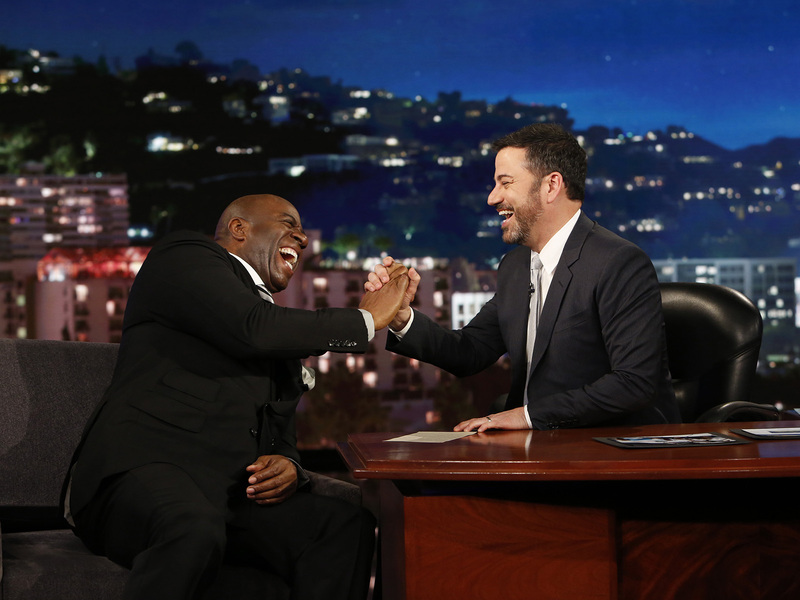 For now, the investigation appears focused on comments made by Lakers President Magic Johnson during an during an appearance on the Jimmy Kimmel Live show which aired on Apr. 21, 2017. During the interview, Kimmel introduced the discussion of tampering in a very light-hearted way. He asked Johnson if he was looking to add Chris Paul, Paul George or Teen Wolf—yes Teen Wolf—to the Lakers roster. Had Johnson ended his answer at that point, his response would have been fully compliant with league rules. Saying hello to a person who is employed by another team constitutes isn’t tampering. It’s basic manners. Johnson, Kimmel and the audience all laughed. As evidenced by his own hearty laughing, Johnson clearly assumed his answer was in good fun and that his “wink-winking” line was a physical form of sarcasm. The audience seemed to view Johnson as kidding around. After all, Jimmy Kimmel Live is a late-night talk show hosted by a well-known comedian. It’s commonplace for guests to joke around while answering questions from Kimmel. Further, the 58-year-old Johnson is a sophisticated and experienced sports executive. He obviously would not go on a national TV show and admit to a plot to tamper. But as explained more fully below, a finding of tampering doesn’t require intent. In fact, it doesn’t require very much at all. If the NBA concludes that the Lakers and/or Johnson tampered, potential penalties would range from a warning, a fine that wouldn’t exceed $5 million, a suspension of Johnson for a definite or indefinite period, forfeiture of Lakers’ draft picks, transfer of Lakers’ draft picks to the Pacers or—and this is the big one—a prohibition placed on the Lakers from signing George for a definite or indefinite period. Tampering is a relatively simple concept in theory but remains sometimes difficult to evaluate in practice. Tampering refers to any attempt to persuade a player, coach, trainer, general manager or any other person who is under contract with another team to join the tampering team. Although those held responsible for tampering tend to be owners, general managers or coaches, players can also be found to have tampered. Tampering is an odd concept in a free market economy such as ours. Most of us work in jobs where it is acceptable to speak with prospective employers about new opportunities. Usually we can also pursue those opportunities. The NBA isn’t a free market—by any stretch. The league has promulgated rules that substantially limit how and when teams compete. Whether those rules cap how much money teams can spend on players or restrict how teams can sign prospective NBA players (imagine, for a moment, an NBA with no draft), the NBA is full of rules that constrain competing. A rule designed to stop tampering follows that same pattern. The logic of these “anti-competitive” rules is that although they may at times disadvantage individual teams, they nonetheless advance the interest of the league as a whole. The NBA’s legal framework for tampering is found in Articles 35 and 35A of the league’s constitution. Among other things, these articles establish that the NBA commissioner has the authority to determine whether tampering has occurred. In that capacity, the commissioner takes on the role of an arbitrator. He listens to testimony by the relevant personnel and weighs evidence offered to show or disprove tampering. The commissioner then reaches a decision and, so long as the guilty party isn’t a player, the decision is final and non-appealable. In theory, a team could attempt to challenge the commissioner’s decision (also known as an arbitration award) in court and demand that the court vacate the commissioner’s decision. In reality, such a lawsuit would almost certainly fail. Teams contractually agree that the commissioner has final authority to resolve disputes between teams. • In 1995, the Miami Heat tampered with the New York Knicks. Heat executives had reached out to Pat Riley, who was under contract with the Knicks, to discuss joining the Heat. As a penalty, the Heat transferred their 1996 first–round pick along with $1 million to the Knicks. •​ In 2010, Dallas Mavericks owner Mark Cuban tampered with the Miami Heat by expressing his interest in signing LeBron James, who was under contract. Notice the “low bar” for tampering: even though every NBA owner would want to sign LeBron James if they could, simply stating the obvious can be considered tampering. That is because even an obvious statement could encourage the player to think more about a particular team. Cuban was fined $100,000. •​ In 2013, the Atlanta Hawks tampered with several teams by mailing a season ticketholder letter that mentioned the team’s desire to sign specific players who were set to become free agents. The letter constituted tampering because those players were still under contract at the time the letter was sent. The Hawks were fined. •​ In 2013, Sacramento Kings coach Michael Malone tampered with the Los Angeles Clippers by simply saying that Chris Paul would “look pretty good in a Sacramento Kings uniform.” Like the Cuban and Hawks examples, Malone obviously did not intend to tamper. He instead uttered a statement that every NBA coach would make: they’d like Chris Paul on their team. Still, the statement was tampering because it was directed at a specific player who was under contract with another team and encouraged him to think about joining another team. As I wrote earlier this summer, NBA players frequently engage in conduct that seems like tampering. Draymond Green, for example, texted Kevin Durant about joining the Golden State Warriors while Durant was still under contract with the Oklahoma City Thunder. Boston Celtics guard Isaiah Thomas has talked openly about recruiting players during All-Star Weekend. Portland Trail Blazers guard C.J. McCollum recently posted an Instagram photo of Knicks forward Carmelo Anthony wearing a Blazers uniform. The list goes on and on, and suggests that the NBA isn’t too worried about player-to-player tampering. Only once has an NBA player been publicly reprimanded for tampering. That occurred in 1999 when Chicago Bulls center Will Perdue spoke about trying to entice former teammate Tim Duncan to join the Bulls. Perdue was admonished by then-Commissioner David Stern. The NBA has retained a prominent law firm, Wachtell, Lipton, Rosen & Katz to aid in the Lakers investigation. The firm is obviously a private company and thus doesn’t have subpoena powers to compel the disclosure of records and other evidence. Still, NBA teams and their employees are contractually required to comply with Wachtell’s requests for statements and evidence. To the extent Silver finds Johnson’s remarks to cross the line into tampering, the most likely outcome would be a fine levied on Johnson. While Johnson’s statements to Kimmel technically meet the low bar of tampering, they were clearly made in jest and likely weren’t all that influential—it’s doubtful that George’s calculus on the possibility of signing with the Lakers changed based on Johnson winking in an exaggerated fashion. Other NBA figures have faced fines for similar kinds of mild tampering. The KD Text: Is Draymond Guilty Of Tampering? If, however, the Lakers’ tampering proved more extensive, such as communications between Lakers officials and George or his representatives, then it would be an entirely different ballgame. Some of the more draconian punishments mentioned above—such as the Lakers having to transfer draft picks to the Pacers or George being barred from signing with the Lakers—would become plausible outcomes. As Adam Silver displayed in the Donald Sterling saga, he doesn’t shy away from enforcing the league’s constitution in the most impactful ways possible. Silver is clearly willing to send a message. If necessary, he would make an example of the Lakers.